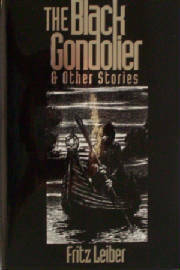 I have finally introduced myself to the weird fiction of Fritz Leiber via the collection, The Black Gondolier & Other Stories. It has impressed the hell out of me. The title piece alone has been a revelation. Edited by John Pelan & Steve Saville it was originally released by Midnight House as a limited hardcover. Though this has since gone OOP, the editors reissued it digitally through E-Reads. It’s available from all the usual suspects. Leiber stirs character, atmosphere, insight and entertainment in to a roiling cauldron of delicious poison. He makes it look easy, the stories are fluid and seamless. Even in the instances where the endings are visible on the horizon they are not a disappointment because they are inevitable. His authenticity, and the natural course of the prose validate the things you encounter along the way. He stitches his underlying themes together in a way that is never overbearing, and for me was perhaps his most enviable trait. Leiber’s genius is no secret, he was awarded every prestigious honor through his life that was out there. I’m just late to the celebration. While there were stories I preferred over others here, I enjoyed them all. I wouldn’t hesitate to call The Black Gondolier a masterpiece. Supernatural dread, conspiracy, and awkward friendship drape each other in this tale that remains relevant and powerful. Without going into details, Leiber infuses the world with a logic that other authors might leave open to the unknowable. Whether the logic of the enlightened or the mad, it informs the tale and makes this a potent classic I will re-read over and over both for entertainment and study. Other highlights: The Dreams Of Albert Moreland, Lie Still, Snow White, Spider Mansion, The Dead Man, The Secret Songs and others.